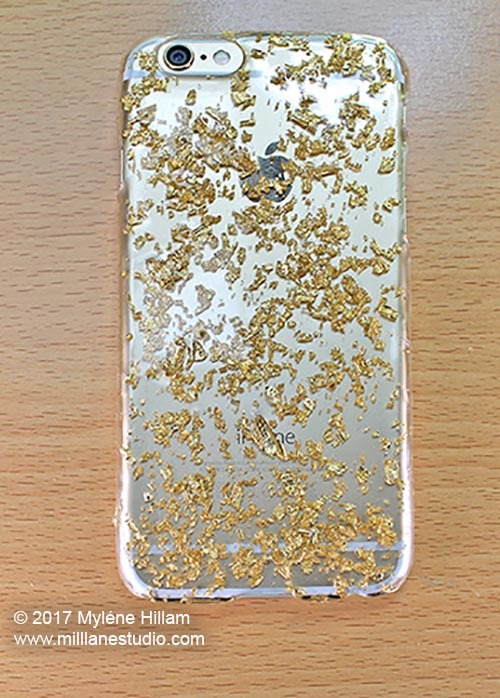 Give Your Phone a Luxe Makeover with Gold Leaf. 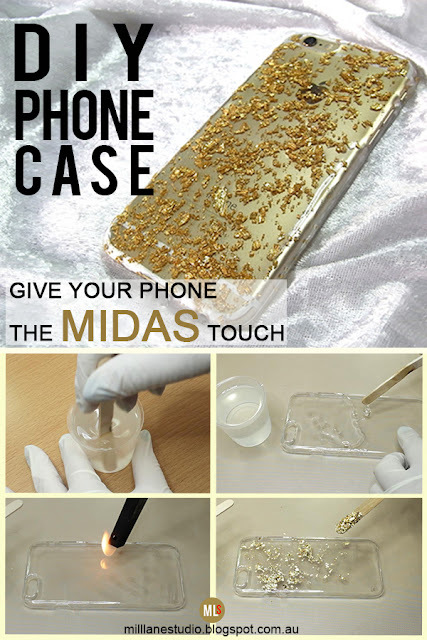 This project is great if you want to personalise your mobile/cell phone or any other portable device. All you need is epoxy resin, gold leaf flakes and a clear plastic case to fit your device. ...... and mix it following the package instructions. 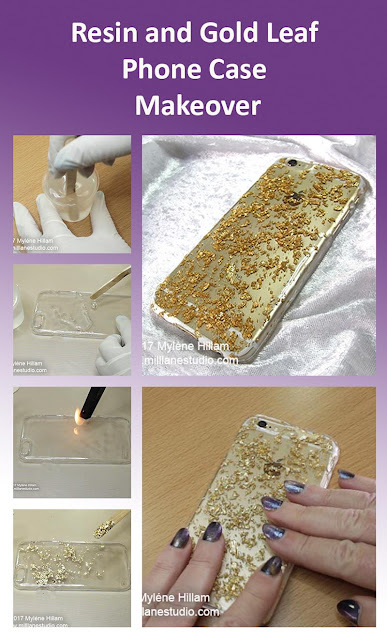 Apply the resin to the OUTSIDE of the case. 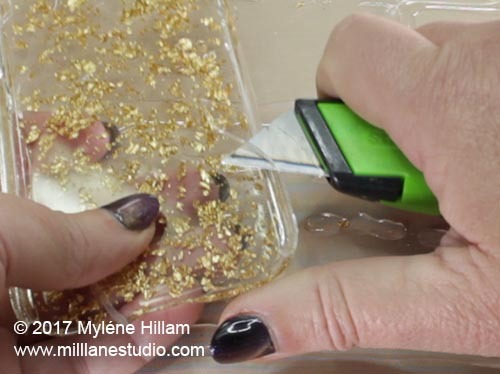 It's easier to control when you drip the resin onto the case rather than pour it on. The side of the wooden stir stick will help you spread it out evenly. It’s OK if some of the resin goes over the edges because they’ll be covered later anyway. Pass a gas lighter over the surface of the resin to pop any bubbles. It’s important to keep the flame moving at all times. 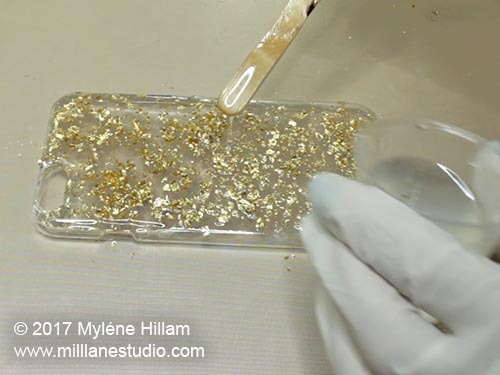 Now comes the fun bit: sprinkling the gold leaf flakes onto the resin. Sprinkle them from a height to distribute them evenly. 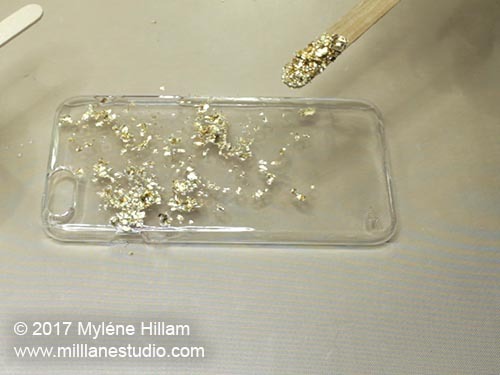 For a luxe look, sprinkle on a lot of flakes but if you want to see more of the phone case through the resin, then go lightly. 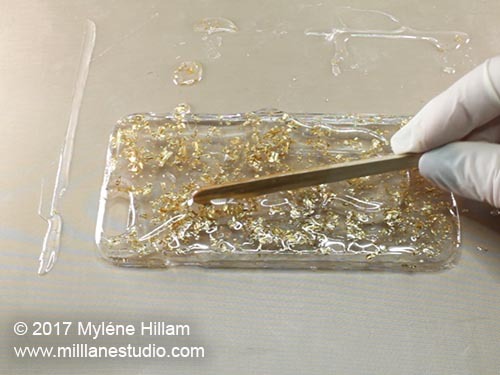 Whilst the resin is still liquid, apply another layer on top of the gold leaf. The flakes will move about a bit and some of the resin will flow over the sides but you can smooth the edges out with the wooden stir stick. Press down any bits that are sticking up with the stir stick. 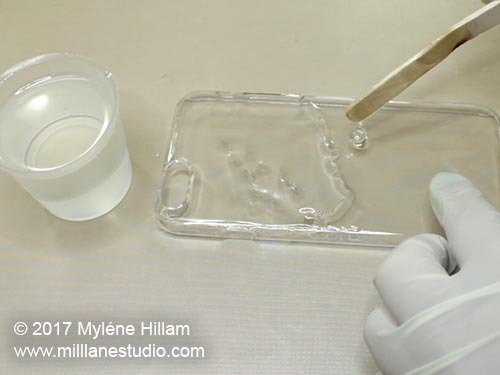 Once the resin stops spilling, move the phone case to a clean spot with gloved hands. Now it’s time to leave the resin to gel. This usually takes a few hours. Mix up another batch of resin and spread it across the surface. Once it stops pooling over the edge, move it to a clean spot on your work space and leave it to cure overnight. Trim away any overpour on the edges with a utility knife. 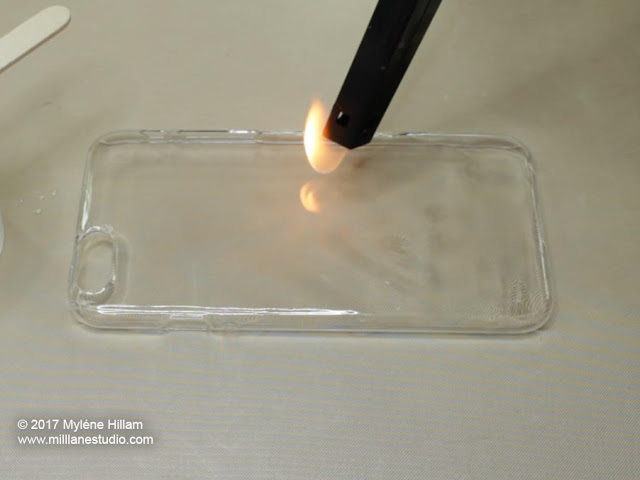 If there are any drips on the inside of the case, remove those too so that the case fits snugly. 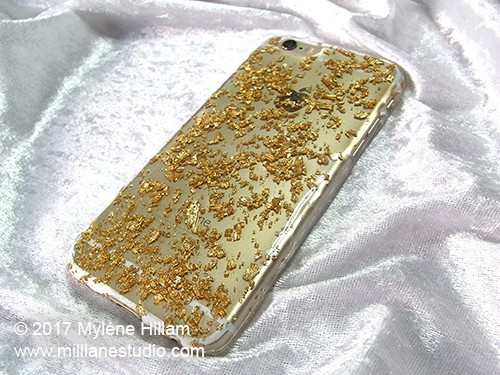 Now your luxe gold metal leaf case is ready to snap into place. Well that was pretty easy! 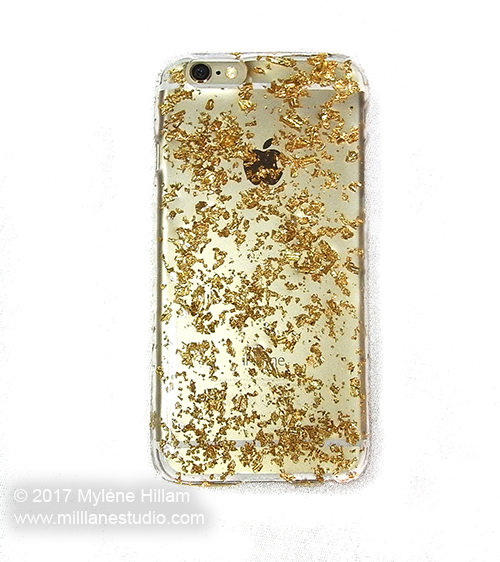 If you're one of those folks who tends to drop their phone a lot, then this case is probably not the best choice for you. But having said that, it will take a fair bit of knocking around. If you get scratches on the surface, you can just add another coat of resin and they'll disappear! Like this project? Pin it for later! 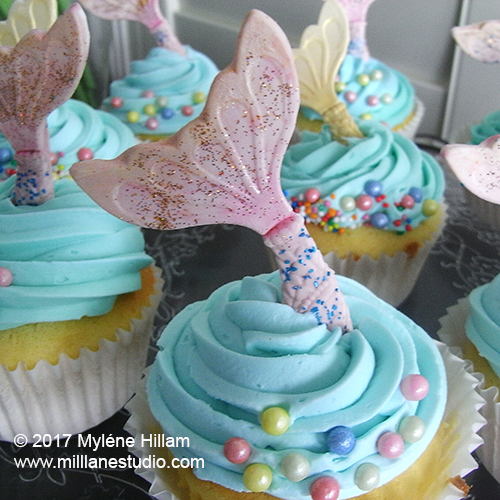 What little girl who would be thrilled to have mermaid cupcakes for her birthday party? 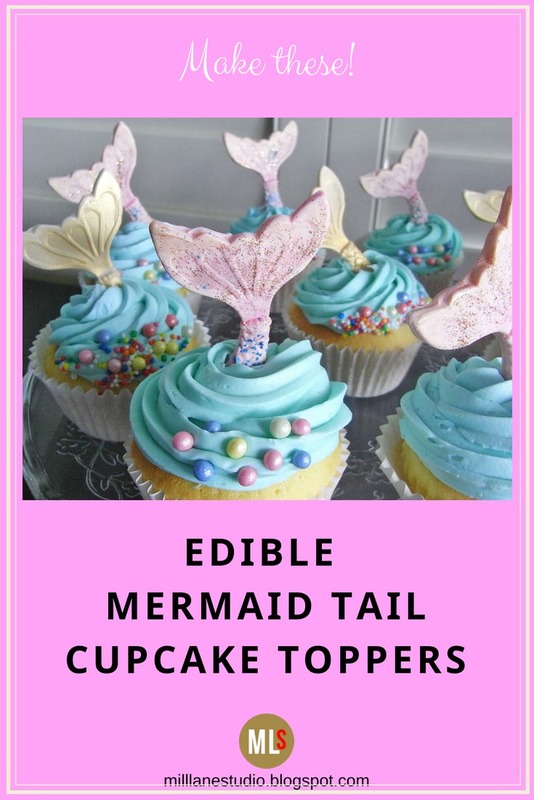 Or for that matter, what big girl wouldn't want mermaid cupcakes? After all, inside every big girl is a little girl at heart! 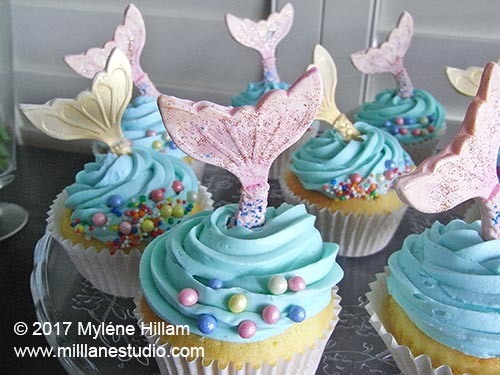 So I'm decorating a batch of these for my Mum's upcoming birthday celebration. But to start, we need to make a mould and I found the perfect item to make one from whilst I was wandering through the toy aisle recently. So, let's get started. Measure out equal parts of Parts A and B of the Silicone Putty. To work out how much you need, I take one part and flatten it out into an oval shape about 6mm (1/4") thick. It should be at least half the length of the mermaid's tail. Roll that into a ball and then take the same amount of the other part. 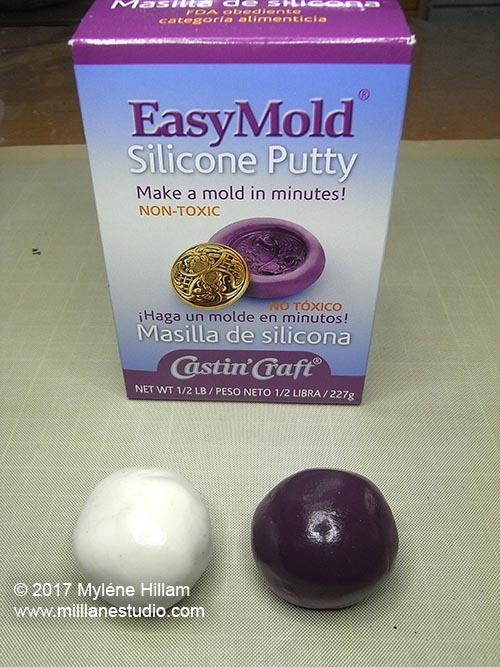 Now you have to work quickly as the silicone putty sets quite quickly. 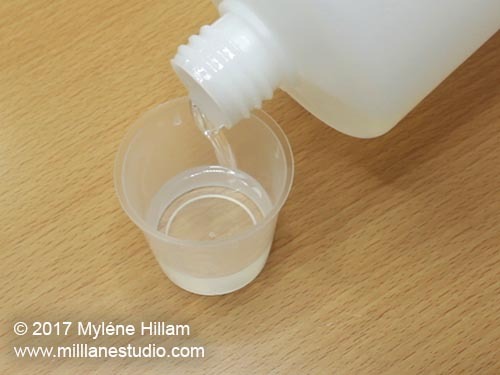 Blend the two parts together until there are no streaks and the silicone is a uniform colour. 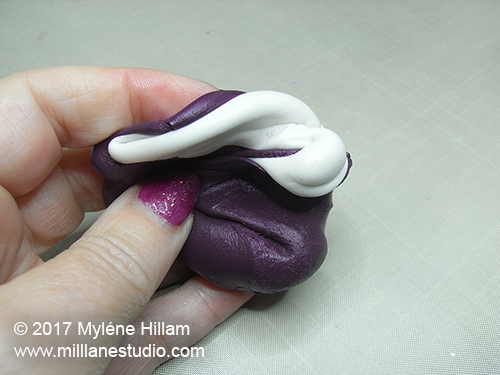 Shape the mixed putty into an a rough oval shape, wider at one end than at the other. 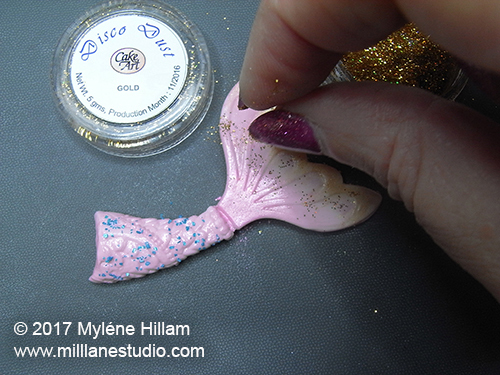 Press the mermaid's tail into silicone and pull the walls up and over a bit to cup the tail slightly. Make sure the mould is at least 6mm (1/4") thick. After about 25 minutes, the silicone should be set. 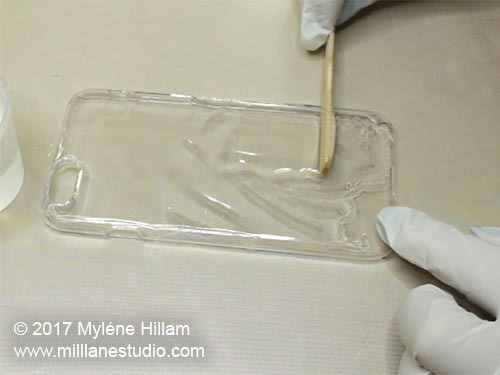 To test it, press your nail into the the silicone. If it doesn't leave an indentation, then it's ready. If it makes an impression, leave it a little longer. To demould, just peel the silicone away on all sides. 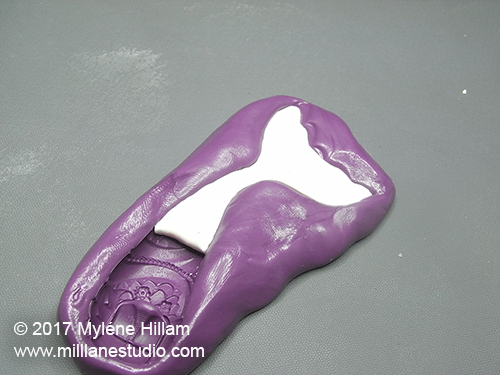 Take a piece of gum paste and flatten it. 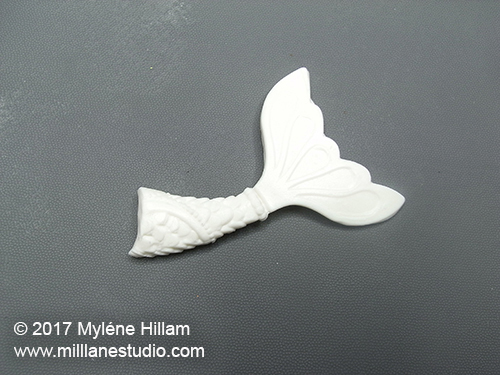 Press this into the fluke area and then work it down from the tail area towards the body. 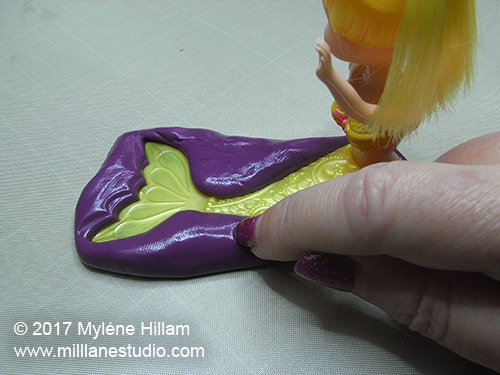 Keep working it along the tail, smoothing it out as you go. You don't need to fill the whole tail but it needs to be long enough to push some of it into the frosting to help it stand up. I made mine about half the length of the tail. Remove the tail gently from the mould. Set the tails aside to dry for several hours. If the weather is cold or humid, you may need to leave them overnight. 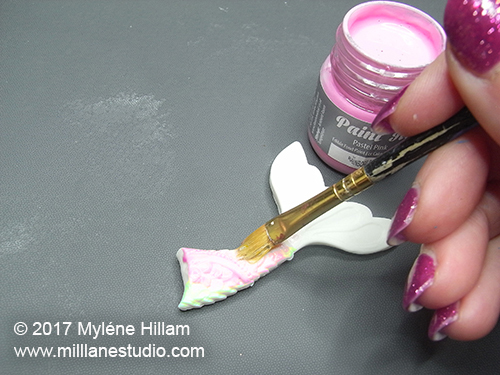 Paint the tail with pastel pink edible paint. 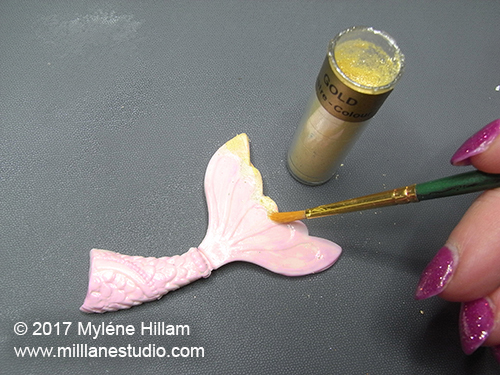 Then dust a little gold lustre dust to highlight the tail and scales. 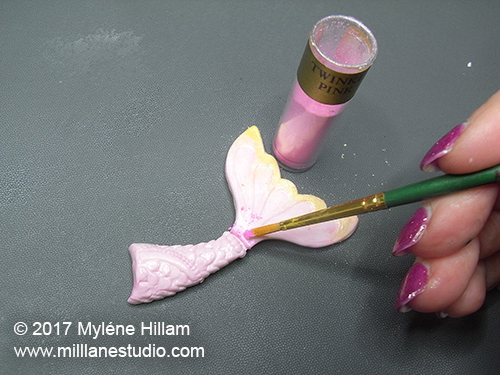 Add some pink lustre dust to give the tail a pearly look. 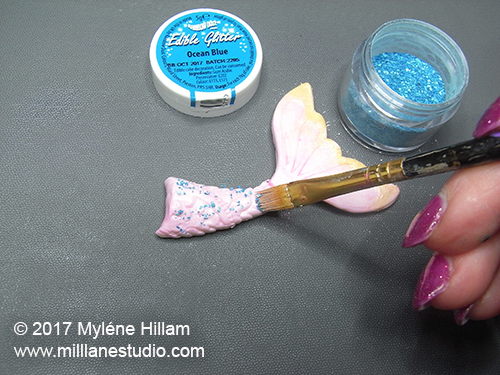 Brush on some blue edible glitter on the tail whilst the paint is still wet. And finally, sprinkle the gold disco dust across the fluke. 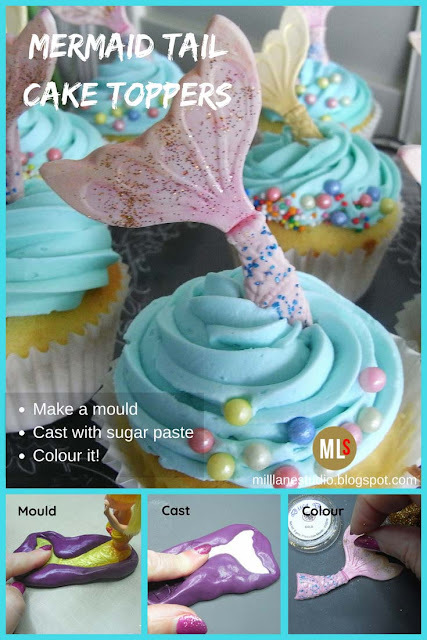 Once the paint is dry, you can assemble the cupcakes. Decorate the cupcakes with a few sprinkles or edible glitter and push the tail into the top of the frosting. Because we're using gum paste rather than modelling fondant, you might need to leave them for a couple of days to firm up before placing them in the frosting. 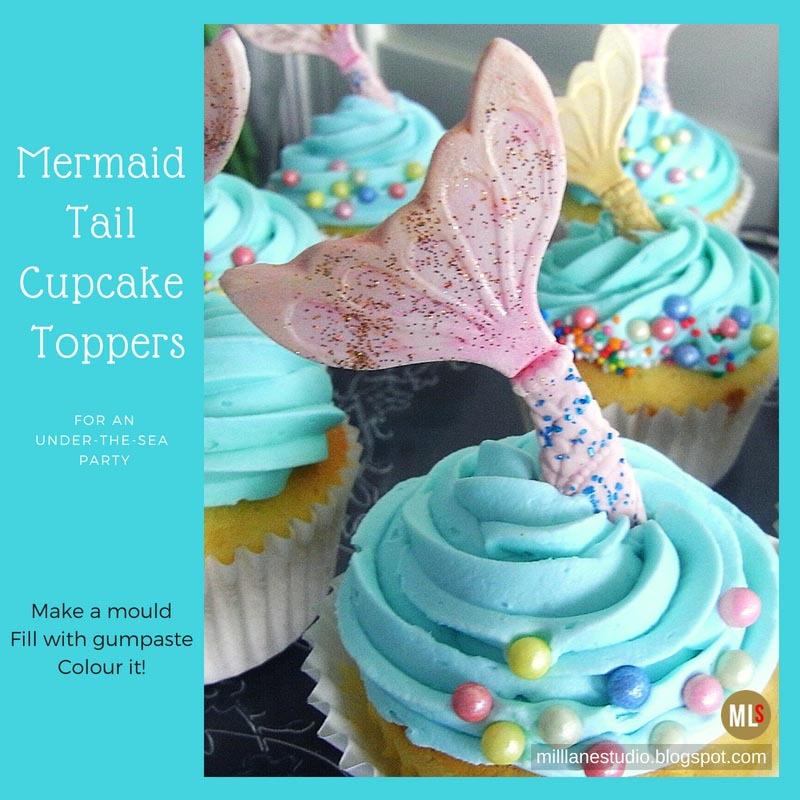 These are perfect for so many different party themes: By the Sea, Little Mermaid, Hawaiian, Tropical, Summer, to name a few. Not got little girls in your household? No worries. Paint them black and white and turn them into whale's tails or paint them silver and turn them into fish instead and satisfy the fishermen in your life! Just one last thing before I go.... always keep your food moulds for food only. I seal mine in a ziplock bag marked "food stuffs" so that I don't get them mixed up with the moulds I use for resin.